NOTE: I appreciate all of your comments. But before you comment that you don't care for books about zombies, understand that I don't, either. I preview many young adult books before I'll let my fifteen year old read them. She's very impressionable, and I'm trying to do my job as a parent. This is the first zombie book I've ever read, and I probably won't be reading another one for a very long time. 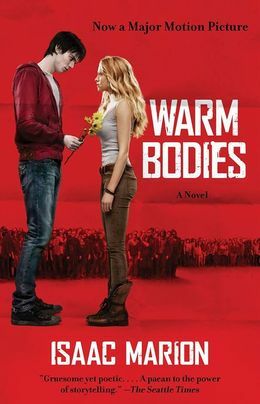 This week I read Warm Bodies by Isaac Marion. It's an allegory for Romeo and Juliet that's more of a comedy than a tragedy because it has a happy ending. R (Romeo) is having an identity crisis as a zombie. He can't remember his life as a human...he can't even remember his own name other than the initial "R." He's also losing his appetite for humans. One night when he and his friend, M (Mercutio), leave their airport home to go into the city for a bite to eat, R saves a girl named Julie (Juliet) from being eaten by the other zombies. He takes her home to his Boeing 747 where he shares his many accumulated treasures and Frank Sinatra albums. The last person R eats right before saving Julie is Julie's boyfriend Perry (Paris). R saves chunks of his brain, and as he slowly consumes it he learns about Perry's life and his relationship with Julie. R and Perry also begin an internal dialogue that is fun to read. Julie knows that there is something wrong with R, and she doesn't think he's a total Zombie. As the pair listen to music (mostly Sinatra), share frozen pad thai from the airport food court, and learn to drive a classic Mercedes from the airport's parking deck Julie names "Mercy," they fall in love. Their love sets of a string of events that brings hope into a post apocalyptic world. I was pleasantly surprised with this book: I really liked it! I know that most zombie books aren't like this (a retelling of a Shakespearean play), and I didn't find it in the young adult section (it was in adult fiction). I found this odd because its length was more in line with a YA book as was its subject matter. If the book had less adult language and didn't have extremely scary skeletal zombies that screamed, it would be a great introduction to Romeo and Juliet for younger teens. I think this book is more appropriate for older teens. The movie is being released on February 1st, and I hope that it's a good adaptation. I do know that R is in his late twenties/early thirties in the book, and was a young professional, possibly a physician. He wears a red tie. In the movie, he is in his late teens or early twenties, and was probably either a student or unemployed, and he wears a red hoodie. I'll also be disappointed if there isn't any Sinatra on the soundtrack. I do plan on seeing the movie soon after it's released. This is the second trailer for Warm Bodies. Please link up your latest reads! I have to say the trailer for the movie looks adorable. I chuckle every time I see it. I'm not one for zombie stuff either, but this one looks rather humorous and endearing. I don't care much for zombies movies, but after seeing the trailers for this one I have to see it. I did not know it was from a book. When you see it tell us if the movie was close to the book. You are a GREAT mom to do that and don't let anyone else tell you otherwise - zombies or no zombies. Thanks so much for hosting, Ricki Jill. Hope you don't mind that my contribution is a bit different this week. Oh, I saw this preview the other day and thought it looked silly but not the typcial Zombie movie. I had no idea it was a book. I am a sucker from retellings so this one is going on my TBR pile. I've only read one other Zombie novel and I didn't realize what I was getting into when I started it. It too is a young adult. Maybe young adult zombie books are just better than others. Great review, great mom, now are you taking her to the movie? I just ordered this book! Great minds...I teach grade 8 and don't lend books to my students unless I've vetted them first. You might want to try "Forest of Hands and Teeth" next or 'Generation Dead'. I started reading this last night... what a cool spin on Romeo and Juliet!